Motorists who drive electric cars in Northern Ireland are to benefit from a £9m UK-wide scheme aimed at encouraging more people to make the switch. 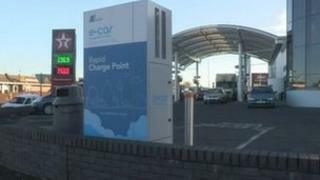 £600,000 will be spent across Northern Ireland to install charge points for e-cars in public places. One hundred extra charge points will be set in place at hospitals, health trusts, libraries and local council offices. It brings the total of charge points across Northern Ireland to 500. Regional Development Minister Danny Kennedy said: "This is a very significant boost for our growing e-car infrastructure in Northern Ireland. "With electric cars costing from just 2p a mile to run, drivers have an ever increasing range of options when considering the type of car they choose to drive." Environment Minister Mark H Durkan said: "With major manufacturers continuing to add electric vehicles to their ranges, there has never been a better time for drivers to consider switching to these cars of the future. "E-cars provide a genuine alternative to fossil fuel powered vehicles and will help us to meet our climate change, air quality and noise objectives and support the transition towards a low carbon society." 130 electric car charge points for NI but will anyone use them?